The transition from winter to spring can be challenging for many motorists. After all, wind, rain, potholes and other obstacles can suddenly reappear at a moment’s notice. 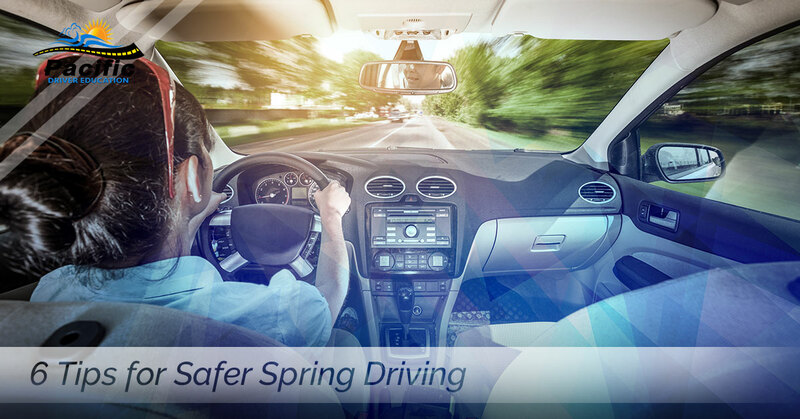 What this means is that spring should also be a time when drivers adjust their habits in order to fit the season. With that in mind, Pacific Driver Education – where we give private driving lessons in Beaverton, Oregon – would like to offer you some driving tips for this temperamental season. Remove your winter tires: Winter tires that are left on your vehicle too long can cause damage to the roadways. Do yourself and other motorists a favor and remove your tires once temperatures rise above 44° Fahrenheit. Watch for motorcyclists and cyclists: Warm weather is an invitation for the drivers of two-wheeled vehicles to pour out onto the road. Watch for these smaller, more maneuverable vehicles in your blind spot and prepare to share the road with them. During showers and rainstorms, increase the distance between you and the vehicle you’re following: Spring showers can pop up out of nowhere and then quickly disappear. During inclement weather be sure to follow the two or even three-second rule. Choose a fixed point that you and the lead car will be passing. If, after it passes that point, you reach the same point in less than two or three seconds slow down. You are following too closely. Check your wiper blades: The winter’s snow, ice and salt can all conspire to wreak havoc on your wipers. Replace your wiper blades as needed and use good wiper fluid to increase your visibility. Watch for potholes: Be on the lookout for these seasonal hazards as they can damage your vehicle and endanger the safety of all motorists and pedestrians. If you cannot avoid potholes then slow down and travel over them cautiously. Watch for children: Be careful and look out for children especially as you travel through residential areas and school zones. Children don’t always look before venturing out into the street so it is up to us adults to look for them. In short, spring can be quite a volatile season. Be sure that in your relief that the snow and ice of winter are over that you do not forget the hazards this season poses for motorists and pedestrians alike. Also, the next time you say to yourself, “who can teach me to drive in Portland Oregon,” consider our expert instruction.